Hillary Clinton was stunned when then-FBI Director James Comey reopened the agency's investigation into her private email server just days before the 2016 election, she told TODAY on Wednesday in her first live interview since the race. "I was just dumbfounded. I thought, 'What is he doing?' The investigation was closed — I know there's no new information," Clinton said about Comey's Oct. 28 letter that reintroduced his agency’s probe of her emails. "And then it became clear, this was not necessary. He could've called me up, he could've called others involved up and said, 'Hey, can we look at this new stuff just to make sure it's stuff we had before?'" she said. "I feel very strongly that he went way beyond his role in doing what he did," Clinton added. Comey's decision to renew the investigation 11 days before the election has been credited as one of many factors that contributed to Donald Trump's surprise win in November. Clinton, however, called it "the determining factor" in her loss, and citing political analysts, said "I would've won" if Comey hadn't intervened. "It stopped my momentum. It drove voters from me," Clinton said. "And so that, in terms of my personal defeat, was the most important factor." But she disagreed with Trump's decision to fire Comey, saying that the former FBI chief "should’ve been disciplined for the way that he behaved on the email investigation." "He was fired for the wrong reason," Clinton said of Trump's termination in May of Comey. Trump initially said Comey was canned over the way he handled the investigation of the former secretary of state, but then indicated it was due to Comey's Russia probe. 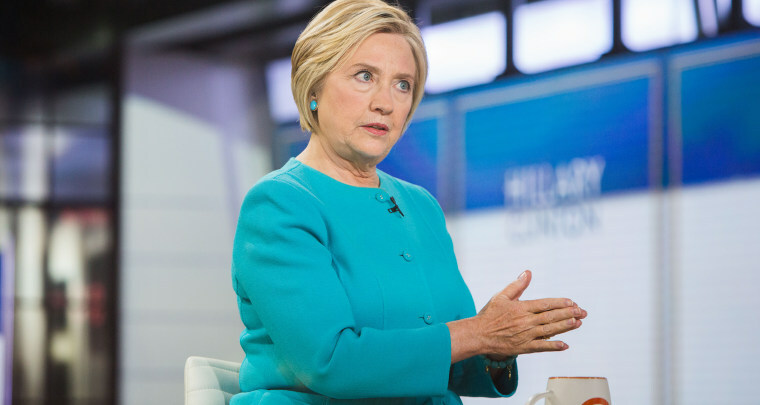 Clinton, in her interview, also pointed to "endemic sexism and misogyny, not just in politics, but in our society" and Russian interference in the 2016 race as reasons for her loss — and said that when it came to the Kremlin's meddling, she would have "stopped at nothing to make sure this never happened again to anybody," if she had been elected. But she denied that she had made enough mistakes herself to lose last year's election. Clinton's interview came a day after the official release of her book, "What Happened," in which she reflects on her failed presidential ambitions and discusses some of her "own shortcomings and the mistakes we made." "I take responsibility for all of them," she wrote in the memoir. "In my more introspective moments, I do recognize that my campaign in 2016 lacked the sense of urgency and passion that I remember from (husband Bill Clinton's 1992 campaign)." But she also used the book to settle scores with those whom she says kept her from the White House, including Comey, Bernie Sanders, Green Party nominee Jill Stein, and Wikileaks founder Julian Assange, as well as pointing to Russian meddling and the media. Meanwhile, the White House weighed in Tuesday on Clinton's 469-page book, with Press Secretary Sarah Huckabee Sanders telling reporters that she's not sure whether the president plans to read "What Happened" since he's "pretty well versed on what happened." "I think it's sad that after Hillary Clinton ran one of the most negative campaigns in history and lost," Sanders said, "the last chapter of her public life is going to be now defined by propping up book sales with false and reckless attacks. And I think that that's a sad way for her to continue this work."